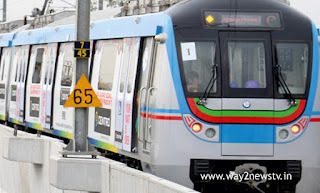 Hyderabad January 9 (WAY2NEWSTV.IN):Aam Aadmi Party state spokesperson and social activist demanded the Indian Sudarshan government to take immediate steps to reduce the fares of Metro Rail tickets to the common man. He has issued a pamphlet designed to reduce metro tariffs under the 'Public Sector' and other public organizations. Sudarshan said, "Metro rail is not available to the common man due to high fare. In contrast to the initial contracts, the increase in metro fares is to cheat people. Corruption irregularities in the expenditure of the project have been made so that the fare would not be made available to the common man. There should be a comprehensive investigation into the matter. Sudarshan said that the movement was undertaken by the public unions to reduce the metro charges and the movement would be eradicated until the falls fall. Harish Leader, Karuppalu Ramesh Goud, Thumma Krishnamurthy, Doll Venkateswara, Banoth Mahendar Nayak, Chennai Shekhar, Anne Leela, Kanakam Venkateswara and others participated.